March 2019 – Over the years we’ve been asked how we plan our travels, and we’ve usually said that we move on or stay put on a whim. But it might be more accurate to say that we generally follow the weather, staying put when it’s nice and moving on when ugly conditions are expected. This has made for some hasty departures with rain, sleet or snow looming, but until this past week we have never been stuck right where we were because of deep mud! 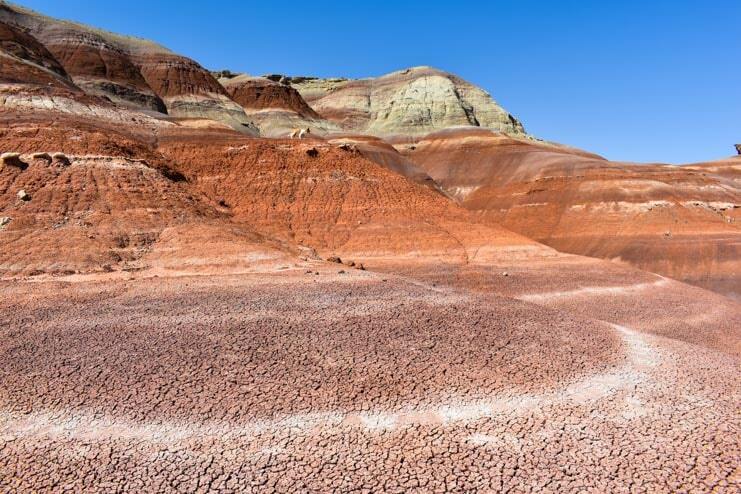 The Utah desert is filled with sandstone, sand and silty stuff, and when it is dry it hardens to something like concrete with a soft layer of dust around the edges. But when it rains for 48 hours, as it did while we were camping, the water soaks into the silty sand and makes a very squishy mud. As we drove to and from our campsite every other day or so, our truck swam through portions of the road, even in 4×4 low gear at 5 mph. There was no way we could tow our 14k lb. trailer out of there. So, we stayed put and we waited for the mud to dry! While we were waiting for the mud to dry we practice the near-far composition techniques we’d learned in our photography workshop the week before. We kept busy practicing the wide angle photo techniques we had just learned. The key to putting some real zing into this kind of photography is having a fabulous sky and a fabulous foreground right at your feet. 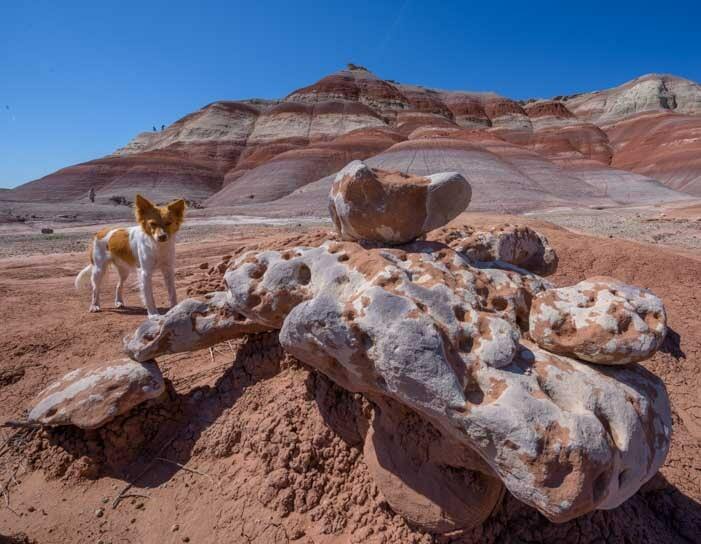 Finding those things is no small trick, though, even in this wonderfully scenic part of Utah. The near-far wide angle view is a new way of seeing for us, but we’re starting to get the hang of it! We spent hours scouring the area looking for engaging backdrops in the distance and fascinating foregrounds at our feet while hoping we’d get a jaw-dropping sunrise or sunset to top it off. The sky didn’t cooperate, but we did find some lovely places and really enjoyed the search. Of course, what’s funny about doing this kind of photography with our pooch Buddy along is that he has a habit of photo-bombing our shots. We’d get everything set up just so, and then Buddy would suddenly wander right through the middle of the photo, sniffing around and curious about what we were up to. Buddy stops by right in the middle of things to say hello! 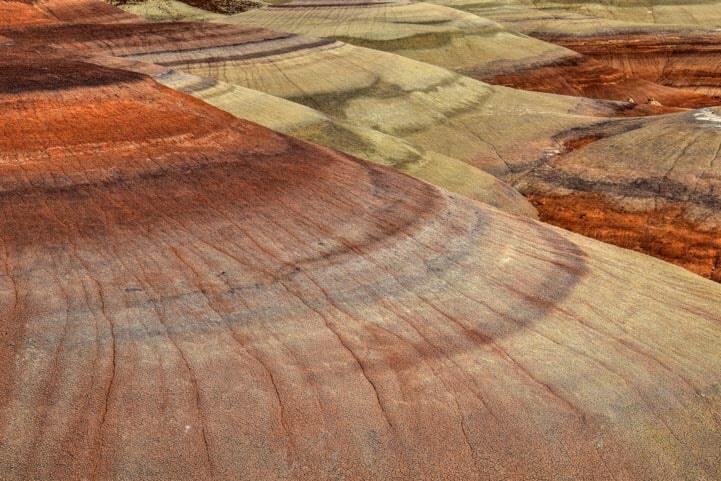 While I was crawling around on my hands and knees to try and capture these ground level images, Mark hiked up onto the colorfully striped mounds in the distance and took some stunning pics of the softly rounded shapes from eye level. 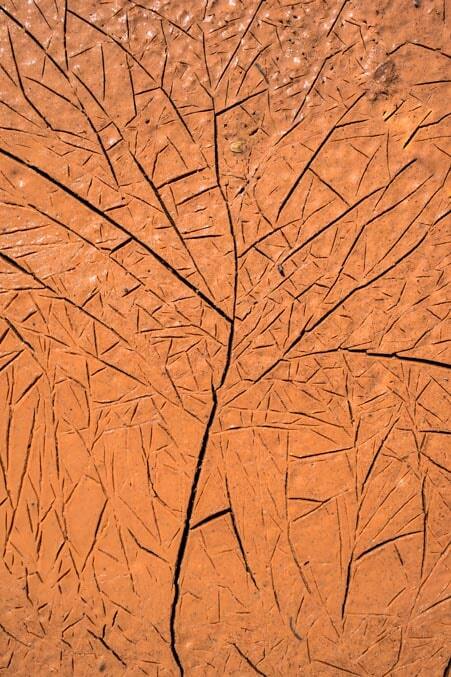 Slowly, the mud slowly began to dry everywhere, and it made pretty patterns of cracks as it shrank. Mark noticed the pattern of a tree in one set of cracks. With the mud quickly drying, we realized our escape from our campsite had to be timed so that the mud on the road was sufficiently dry but the predicted strong winds hadn’t yet begun whipping dust around. Everyday we surveyed the mud and it seemed like our leave-taking was still a few days away. But Mother Nature has her own sense of timing and her own schedule. One day, just as we were returning from a walk down the road and agreeing that we should give it another day or two, the predicted winds suddenly arrived and kicked up some huge clouds of dust. Buddy squints his eyes as he makes his way through a swirling dust cloud. 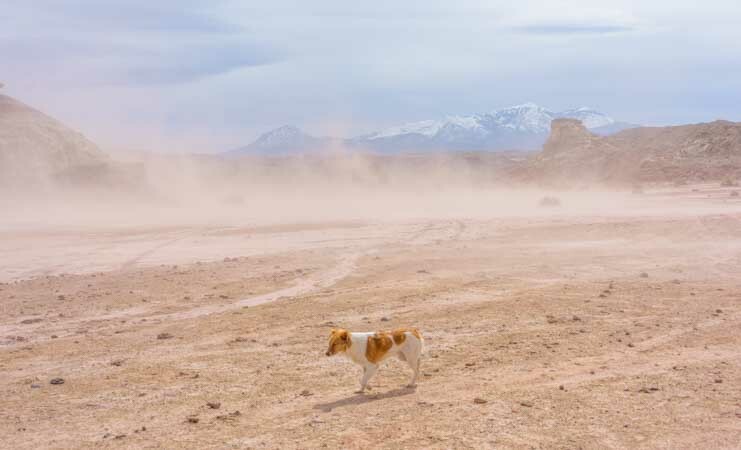 Wild dust storms are the desert West’s answer to the hot and muggy stickiness of mid-summer in the East! When the desert becomes enveloped in dust storms you can get white-out conditions, and that thin layer of silt finds its way onto everything in the camper, even with the doors and windows closed. Just one swirl as you open the door and dash inside can be enough to coat the counters and table with grit. It was time to leave! Within an hour we were swimming down the muddy section of the road, but we had just enough traction to make it out. Once the tires hit the pavement we heaved a huge sigh of relief! We headed south on US-95 which is also known as the Bicentennial Highway because it was completed in 1976. 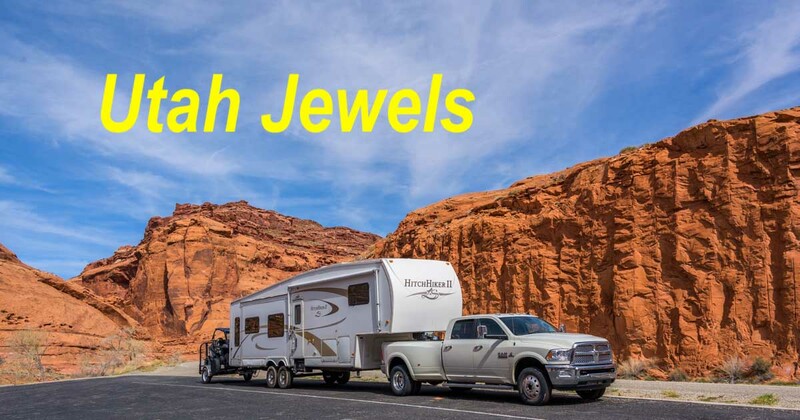 It is one of Utah’s most spectacular scenic drives with occasional pull-outs where you can stop to take a photo or rest a bit. After driving for a while we pulled over to stretch our legs. The beautiful scenery on the Bicentennial Highway was a welcome sight after our great escape! A gorgeous yellow Corvette had stopped too. 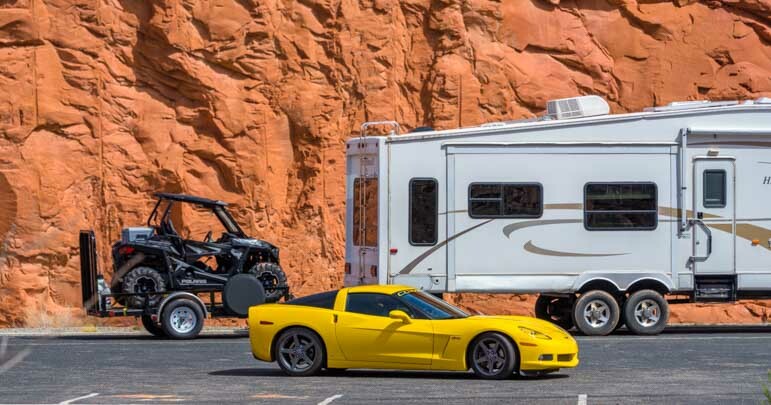 We’ve often said that if we ever stop traveling by RV we might start traveling by sports car and motel. Wouldn’t that be fun! What better way to see America’s incomparable scenic drives that in a zippy and maneuverable Porsche?! We had the chance to do just that in Colorado a few years ago, and what a blast that was! (Blog post here). There are many ways to travel and they’re all fun! We wandered through the brush by the side of the road and crossed a narrow stream and found ourselves in a shallow cave. Such wonders. Our spirits soared as we roamed around. 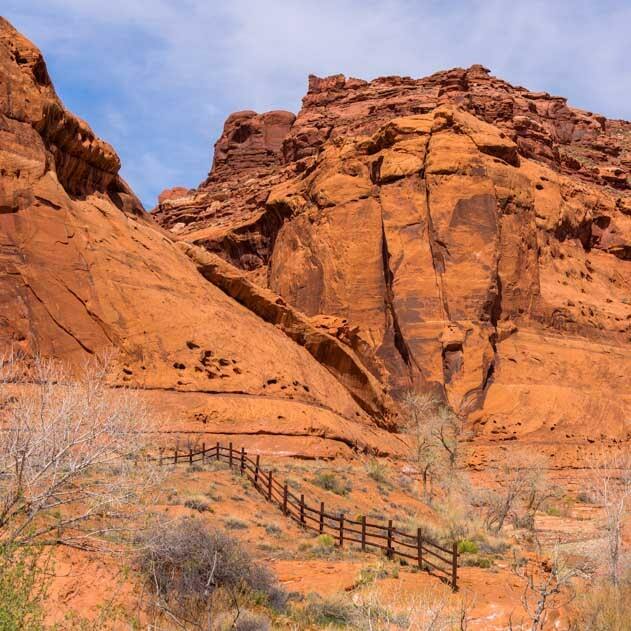 One of the things I love most with Utah’s red rocks is the “desert varnish” on the surface of many cliff faces. It appears as though the gods have taken cans of paint and spilled them over the edges. Jackson Pollack may have made human drip painting famous, but for me, these paintings made by Mother Nature have him beat. 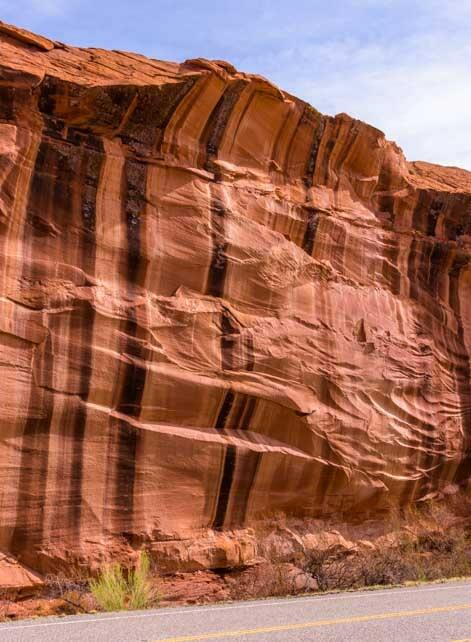 Nature’s drip paintings on towering red rock cliffs. 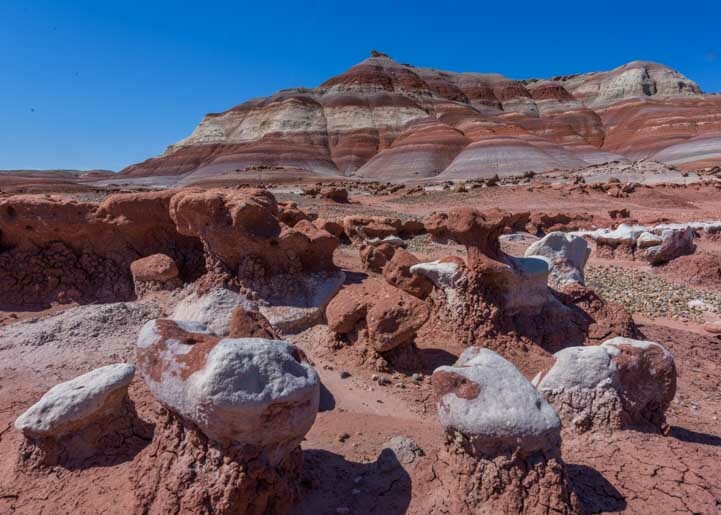 Artistic expression fill human history back to prehistoric times, and the ancients who lived in Utah thousands of years ago were no different. Using some kind of method to impregnate the smooth cliff walls with various colors, they created pictographs that remain to this day. Buddy came across an especially beautiful one. It was about five feet tall and seemed to depict a person wearing a crown of some kind, along with decorations across the neck and shoulders as well as earrings. The figure appeared to have bird wings with long flight feathers, or perhaps it wore a cape that concealed its arms. I have no idea what the thing next to this being was. But surely the person who meticulously created this image eons ago knew exactly what it was. If only it were possible to know the origins of the artwork in the context of the culture that created it. Gazing at this image of a very specific something — human? god? — I remembered my astonishment when we watched a school field trip of young kids visiting the evocative ancient pyramid ruins at Monte Alban near Oxaca in southern Mexico. As the kids sat attentively listening to a guide teach them about some huge stone carvings the Zapotecs had made, he pointed to various images in the stone sculptures and asked the kids if they recognized who they were. With each question, a few kids’ hands shot up and they answered eagerly. They had studied the ancient mythology that had its roots right where they were sitting. This intricately detailed pictograph is about five feet tall and appears to be a person wearing a crown and ornaments around the neck and shoulders, and it seems to have either an elaborate cape or wings. Not too far from this incredible pictograph we found some more recent petroglyphs. The difference between pictographs and petroglyphs is that the pictographs are made by impregnating pigments into the rock face while petroglyphs are made by pecking out an etching. It’s not so easy to make images by pecking, and in many places we’ve seen poor modern attempts to scrape the rock alongside the expertly made petroglyphs that are hundreds or thousands of years old. However, in this spot some enterprising people whose petroglyph efforts are now fading into recent history did a pretty good job of making a lasting impression. 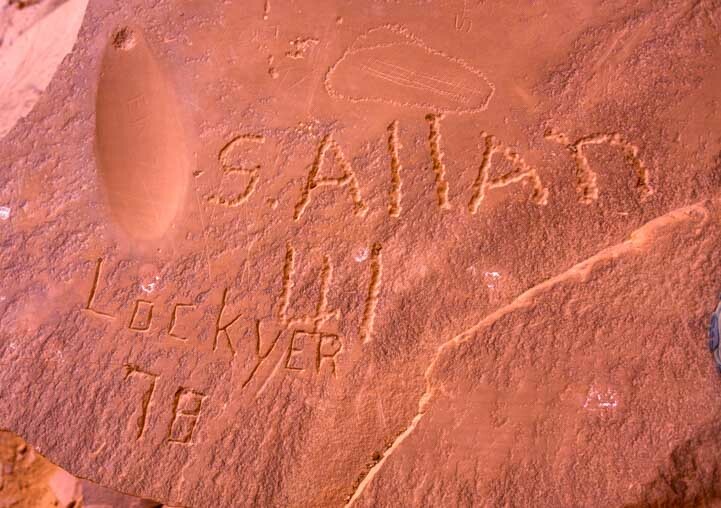 These petroglyphs dated back as far as 1941 which was long before the Bicentennial Highway was built in 1976 and also before Glen Canyon was dammed to form Lake Powell in 1963. 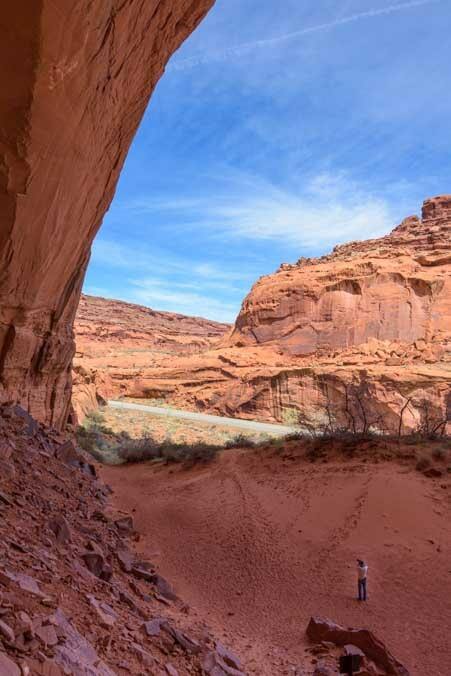 In the 1940s there was just a rough 4×4 road that, legend has it, a local miner had built between Hanksville and Hite using a borrowed bulldozer! Roy and Madeline covered some rugged terrain to put their mark on these rocks. I wonder if they are still around and if they ever return to see their names on the cliff wall. 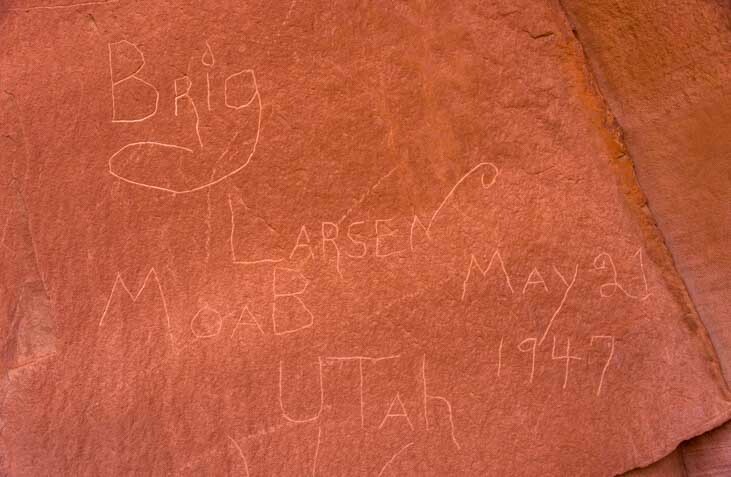 Nearby Brig Larsen left his or her name and listed the town of Moab, Utah (his/her hometown?) and the full date of May 21, 1947. How right they were as they looked 30 years into the future! 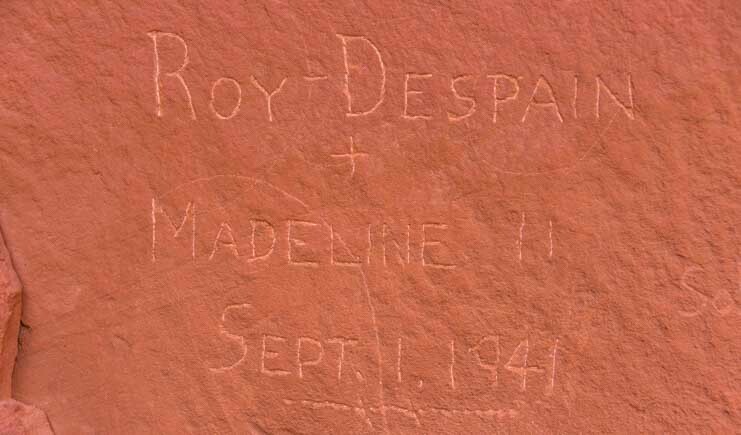 Nearby a Mr. (or Ms.) S. Allan also made a petroglyph with the date “41.” Was he (or she) traveling with Roy and Madeline in 1941? Maybe they all reached this spot together and decided to put their names on the rock much as the Mormon pioneers had done at the Mormon register which is now inside Capitol Reef National Park. Ironically, someone named Lockyer visited to the same spot in 1978 after the Bicentennial Highway was fully built and paved with asphalt. I wonder if he intended to write over S. Allan’s date or if he realized only after he got going with his rock pecking that he hadn’t allowed enough room for his name. Either way, I’m just assuming that the numbers “41” and “78” refer to years these people were here in the 1900s. But who knows, they could be their birth years or they could be numbers from their high school varsity sports jerseys! So it goes with the masterful guesswork of archaeology, whether studying the artistic footprints left 80 years ago or 800 years ago or more. 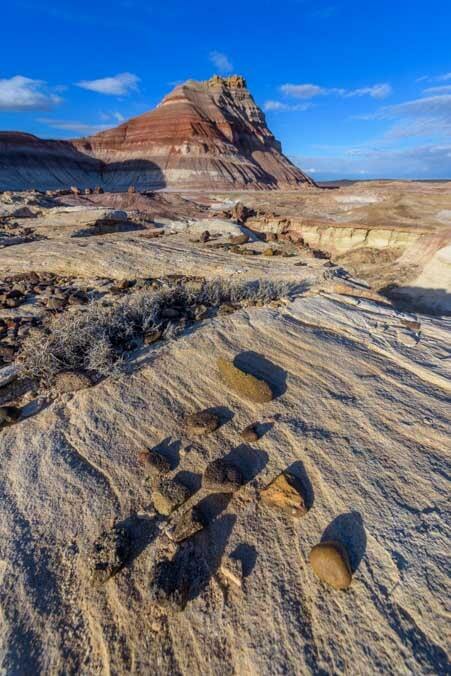 One thing we’ve noticed in the shifting sands of time here in southeastern Utah is that it is not so easy to leave an indelible footprint. We’ve been here only two weeks, yet the footprints and tire tracks we first put down two weeks ago have almost disappeared. The rain and wind have all but erased them from ever being. Even the muddy tracks on the dirt road had already begun to flatten out. 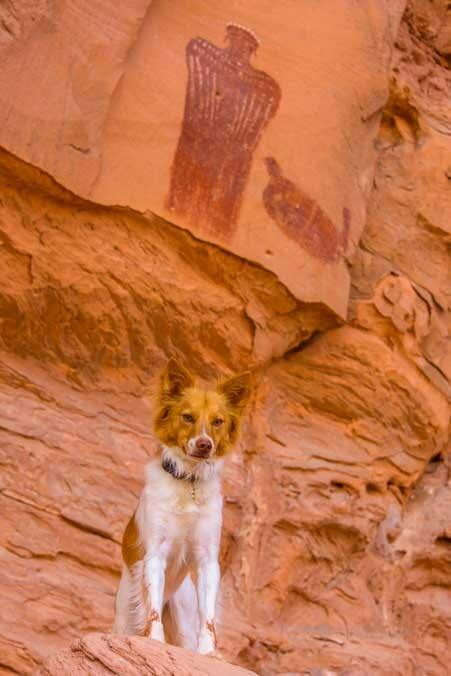 This entry was posted in Utah and tagged New, Rock Art and Petroglyphs, Travel, USA, Utah, Utah Southeast, Utah Southern by Roads Less Traveled. Bookmark the permalink. Emily, I’m thinking that your Porsche looks an awful lot like a Corvette . . . Gorgeous photos (as usual)! I really like the last one of Mark and Buddy – your two guys doing what they love (Mark taking pics and Buddy enjoying life with his family). Have a magnificent day! You know, it looked like a Corvette to me too, Mary, but I could have sworn it had the word “Porsche” across the windshield in large letters! Now that I study the photo I see it has the word “Corvette” on the windshield, but we did see another bright yellow sports car on our drive that said “Porsche.” Or maybe I’m dreaming! If you’re dreaming about a Porsche, at least Mark will know what to get you for your birthday! Thank you for following our adventures. 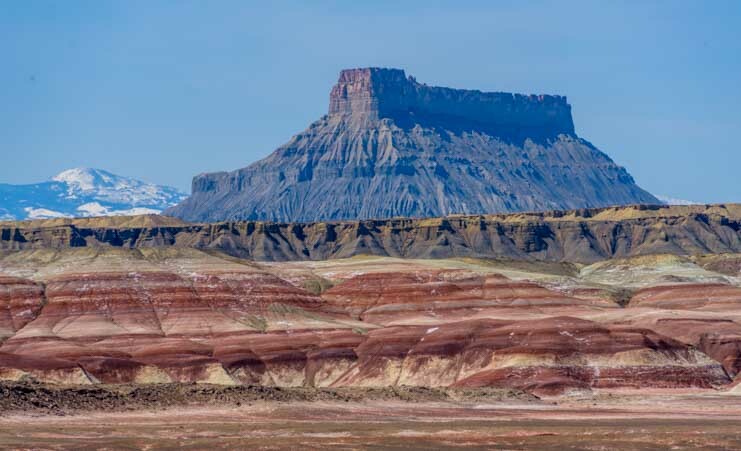 Four Corners is a gorgeous part of America and we find ourselves absolutely enchanted every time we are there. I’m so glad our adventures bring back memories of you happy times there years ago! What?? No pictures of that nice rig deep in some mud? The other photos were great. Are you kidding? Actually our rig was out of the mud — we moved it just in time — but the road to get in and out was saturated. I realized later I should have taken pics of the ruts in the road, but at the time that wasn’t what I was thinking about!!! I do so admire your enjoyment of your lives. Precious possession. We are very fortunate to be living our lives in this unusual manner. It’s not for everyone, but it has given our lives a depth and breadth we didn’t know was possible. Thank you for coming along on our adventures via the web! 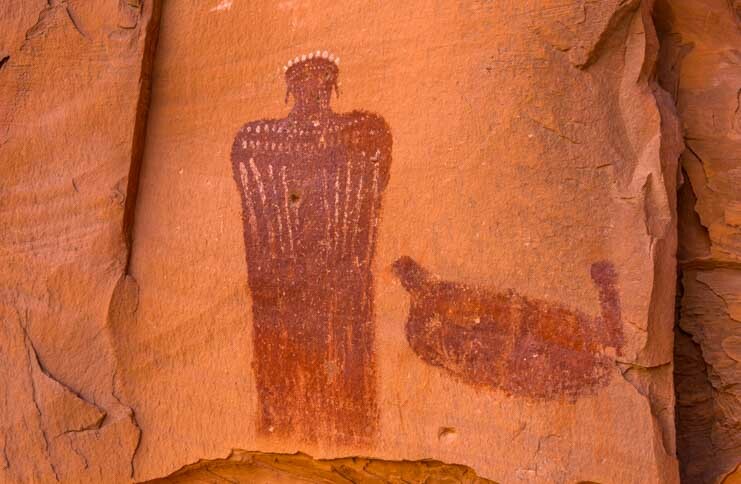 In the pictogram it appears to be a rattlesnake on the ground next to the human figure. It is coiled up poised to strike, it’s tail fully erect and rattling. Fascinating observation! I had been thinking it was a cooking pot of some kind, but I see it your way too and it just makes me all the more curious. These images are so incredible and baffling too! I having been following you 3 for several years now. We love your posts and photos. I think the image next to the the figure is a rattlesnake. Thx for your work, Denise D. Oro Valley, AZ. Thank you for joining our adventures via cyberspace, Denise! Another reader said the same thing about the rattlesnake in the comment above. You guys are on to something! I agree with the rattlesnake observation. That was my impression as well. Thanks for the wonderful pictures of this area! I was interested in the wide angle, foreground background pictures. Just got a 10-18 for my Canon and will be attempting the same! Well, it’s three for three then on the rattlesnake!! You’ll love the 10-18. The trick is to play with the distortion that the wide angle creates and to look for triangles in the foreground that point to the cool stuff in the background — and then get an awesome sky over it all. If you put your camera in Live View and set it to 10mm and then get super close to the ground, you’ll see the distortion. A parallel pair of boards will become a triangle since the far end of each board will angle inwards as they approach the horizon. Something just 5″ to 10″ long can create a fabulous foreground while the towering mountains in the background become the same relative size in the image. Have fun with it. It’s a whole new way of seeing!! Ian’s eBook is fabulous too. Thanks, Bob. We both deleted quite a few of our photos from here, so it is definitely possible to take a bad pic, but the ratio of good to bad ones is a lot higher here than in many other places!! We were so surprised to find those old etchings from the 1940s. Even though they weren’t as mysterious as the ancient pictograph and even though we could easily make assumptions about the folks that left them, they still held secrets we’ll never know! Love hearing more about the new techniques you learned in your recent workshop….the shots using these techniques are stunning !! Isn’t “learning” the best part of living ????? Thanks!! We still don’t feel like we’ve found a super duper composition with the awesome foregound and sky just yet, but at least we know what we’re looking for, and in the next post we’ve got a doozy shot coming up (at least I think so!). Learning is definitely the best part of living, and I think it’s what we’re all here for!!! Hello folks. Today I became one of your armchair viewers. I came across your site by accident as I was viewing the daily Bing site photo. 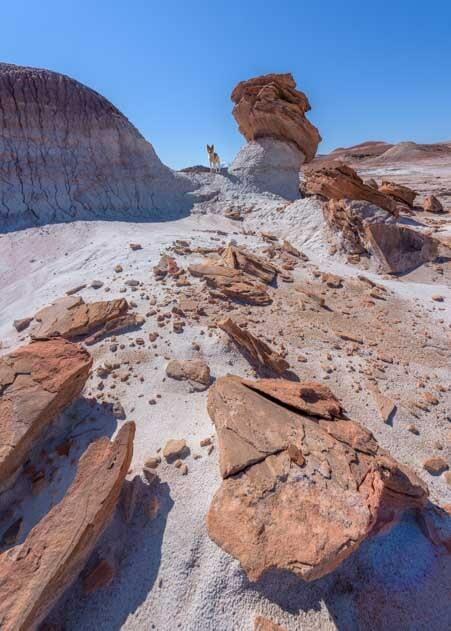 Today’s photos were of the Bisti de na zin wilderness and among them, your photo appeared. For whatever reason, I was drawn to click on your photo and happily, I found an adventure I had always thought about. At most my travels have been a short weeks vaca once to Cuba and another to Mexico or out to a local campground. I will enjoy your travels immensely since I won’t ever be able to do the same myself. So happy trails to you and say hello to Buddy for me! How wonderful, JoAnn! 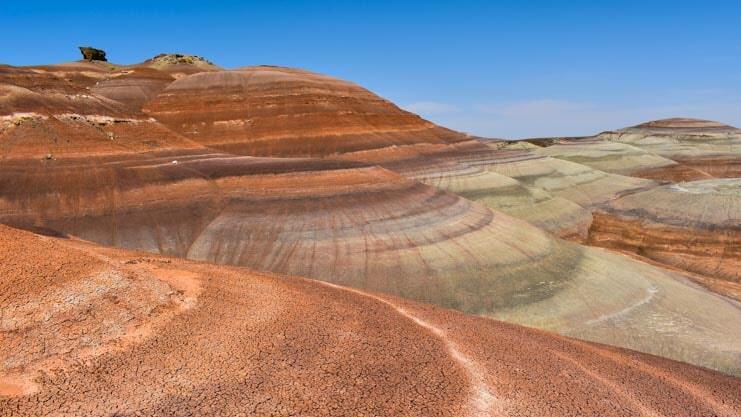 We, too, saw that Bing photo of the Bisti Badlands yesterday — Mark checks the Bing photo every day for a dose of inspiration — and lots of people have visited our website in the last 24 hours because of our photos from that special place. 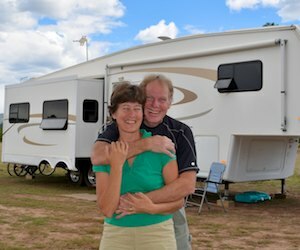 We are so tickled that you decided to continue following our travels after perusing our website. We have had an incredible life since we started traveling full-time twelve years ago, and we hope you get a kick out of joining us via cyberspace and becoming a part of our ongoing adventure. Buddy sends a tail wag to you!